‘The Founder’ has came out at a crowded time of year at the cinema, and it’ll be a shame if it gets lost in the shuffle of major award contenders as it’s a really strong movie. It tells the story of the birth of McDonald’s from a small family business in San Bernardino to the worldwide conglomerate it is today, and like many origin stories of this ilk, the truth is far uglier than the family friendly corporate image the company likes to portray. There are similarities to ‘The Social Network’ and ‘There Will Be Blood’ in John Lee Hancock’s film, in both the idea of the relentless and intertwining pursuits of money and power, and in that of stealing the ideas of others. The Winklevoss twins could never have gone on to create Facebook in the way Mark Zuckerberg did, nor would the McDonald brothers have created the McDonald’s empire in the way Ray Kroc did, but that doesn’t make it right and I thought ‘The Founder’ really got under the skin of its premise. 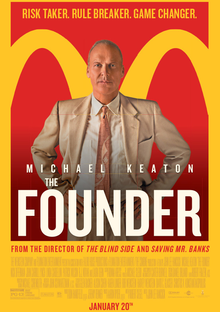 Structurally, I thought ‘The Founder’ was brilliantly crafted, with a dual focus on the larger story about how McDonald’s came to be dovetailing with a character study of Ray Kroc (Michael Keaton), the opportunistic salesman who ultimately kicked off the process that led to McDonald’s becoming what it is today. We join up with Ray Kroc when he was a downtrodden salesman, trudging around the Midwest attempting to sell milkshake machines with the same rehearsed pitch, and it’s hard not to empathise with him at this point. The American Dream wasn’t meant to be this difficult, and the struggles Kroc goes through feel relatable, largely down to Keaton’s superb performance. His first experience of McDonald’s plays out like an advertisement for the company, emphasising the speedy service system which was innovative at the time, and Hancock’s direction really mirrors how Kroc feels at this point, as the opportunity of a lifetime sits in front of him. By the end, Ray Kroc is less a man and more a cold, uncaring monster, but what is so remarkable is the subtlety of this transition to the extent that it sneaks up on and shocks us, primarily down to Keaton’s terrific display and a smartly written script. The McDonald brothers (played by Nick Offerman and John Carroll Lynch) have more modest ambitions for their business, but they’re charmed and wooed by Kroc’s enthusiasm and they give him the go ahead to start franchising the business and methodology, but with strict conditions. It’s no surprise that every time the brothers give Kroc an inch, he attempts to take a mile, and he is wilfully seduced by all the benefits his success and increasing power starts to give him. On reflection, it actually made me quite angry, particularly in terms of how easy it all appears to happen for Ray Kroc, and that’s testament to how skilfully ‘The Founder’ gets under your skin. It’s about a man who stole a family business away from the men who created it, benefited immensely both financially and professionally, whilst they lost basically everything, and all of this achieved through legal methods, which is perhaps the most offensive aspect about the whole story. Hopefully ‘The Founder’ will find an audience because it is a very good movie based on an inherently interesting origin story, and I really enjoyed it.